Opposition parties in Turkey have delayed the government's announcement of its plan to end a conflict in the mainly Kurdish south-east. Interior Minister Besir Atalay ran out of time to present the measures in parliament as nationalist MPs jeered. The plans are thought to include some Kurdish language education, restoring Kurdish place names and more freedom to use Kurdish in election campaigns. The announcement is now expected on Thursday. 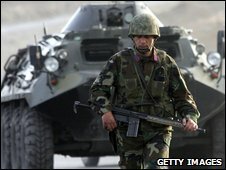 Some 40,000 people have been killed in the 25-year Kurdish fight for autonomy. The government of Turkish Prime Minister Recep Tayyip Erdogan has recently been seeking opposition support for a negotiated settlement to end the insurgency by the Kurdistan Worker's Party (PKK). It first announced the plan three months ago but has yet to publicise details. The issue is very sensitive in Turkey, says the BBC's Jonathan Head in Istanbul. The PKK has been vilified as a terrorist organisation, so making peace is a delicate task for the government. Nationalist sentiment is so strong in Turkey that until recently there was no official recognition of a separate Kurdish identity, our correspondent says, despite the fact that as much as 20% of the population is made up of ethnic Kurds, many of whom speak Kurdish as their first language. Last month Turkey's government was caught off guard when a group of PKK fighters crossed the border from Iraq and announced they wanted to lay down their arms. They were not prosecuted as previous returnees have been, but the euphoric welcome they received from thousands of local Kurds provoked a nationalist backlash. While the government package is expected to allow much greater freedom to use the Kurdish language, the government is almost certain to refuse the request for a general amnesty made by the PKK and its supporters, our correspondent says. Abdullah Ocalan, the PKK leader, has been in jail since 1999. In recent years, Turkish warplanes have launched numerous attacks on rebel hideouts in the autonomous Iraqi Kurdistan region, from where Ankara says some 2,000 PKK guerrillas stage hit-and-run attacks on Turkish territory.